Time creeps past like the beetle crossing our drive, waving its stately black pincers. The minutes slow to a crawl, the hours speed past. Hours spent reading in the hammock end, surprised, by a call to supper. Long moments spent watching stars, admiring the clear band of the Milky Way. In the bleached yellow farmhouse with the blue door all appropriate timetables dissolve. Suitable activities include: identifying butterflies, making brioche, reading comicbooks. The evening aperitif is timed by the cows returning home for their own meal. Mushroom hunting suddenly becomes a positively active and interesting exercise. Armed with baskets and sturdy boots, we squash leaves and peer under thorns. 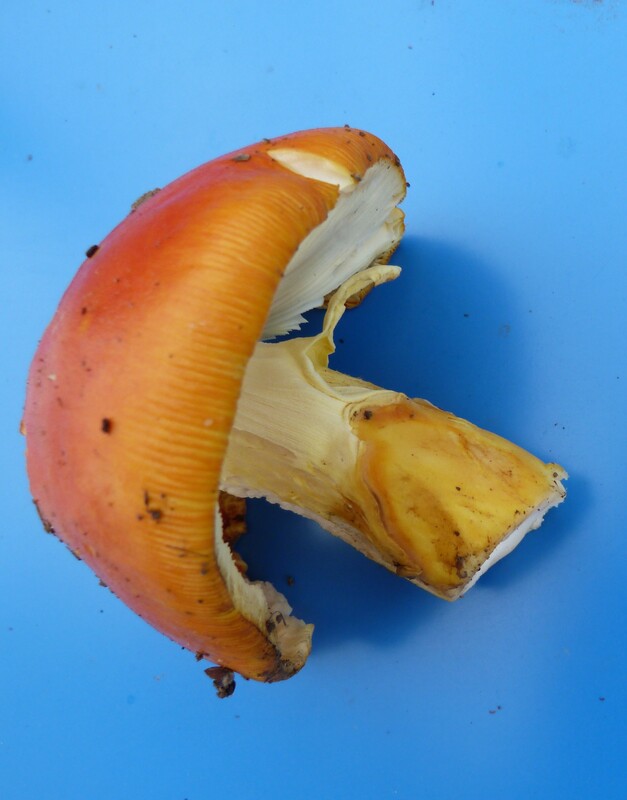 Compete to find the craggy brown cepes, neat girolles and above all the orange ones. Amonita caesarea, funghi only fit for an emperor, that the French just call Oronges. Creamy gills, bright sunset caps. To be found under oak trees, near moss. Take them home, display them proudly on the ping pong table. Brush off any dirt and slice them thick, fry them in butter. “Tastes like chicken,” says my culinary mother. Really? Actually, they do have a beautifully meaty flavour, a smooth texture. Mostly, a stunning colour. I could have eaten just a plateful of Oranges, instead of the freshly grilled lamb and merguez, foccacia, pinenut salad spread out in front of us. But one must be polite. And it was all delicious, of course. Except for the cepes: having watched the cooking process and seen the tiny maggots squirming in panic out of the frying mushroom cap, I just couldn’t stomach the idea. My brother reliably assured me that they were very tasty, if not strictly vegetarian. Brush off the mushrooms cap and cut into thick slices, stalks and all. Heat a large frying pan over a very high heat and add a big chunk of butter. As it sizzles, add a single layer of mushrooms to the pan. Cook for a few minutes on each side, then transfer to a plate and cook the rest. Put all the cooked mushrooms back into the pan, sprinkle with chives, salt and pepper and stir in the creme fraiche. Warm gently for a minute and serve straightaway.